I’m staring at some heavy flakes right now out the office window, and like the rest of my ice fishing brethren, I’m thinking about how it’ll impact my ice journeys during the remainder of our season. It’s a reality of February, and especially March, that especially when traveling to different bites across the ice belt that you’ll contend with heavy snow. Mere days ago we had open ice travel on many lakes in central and southern Minnesota, a rarity for this time of year for sure. Now we’re settling in on a more traditional portion of winter that involves dealing with limited travel and the consequences that go with it. Northern portions of ice-fishing-land had their snow early, around the Christmas Holiday, which is always tricky given the propensity of heavy snow to sink ice and create slush conditions. No matter your machine or manual travel methods, slush is a killer. On a bite in Hackensack around New Years, we high-stepped through a foot of snow, only to stand in inches of water. Drill the ice, and you only make situations worse as water flows onto the ice and under the snow, only to create more of the slush that hampers foot and vehicle travel alike. So how to best attack conditions like this? Well the answer depends on how you’re fishing, what equipment you have at your disposal, and ultimately the amount of work and effort you’re willing to put into the finding vs. the fishing. Of course, there’s some shortcuts learned over the years that’ll hopefully help as the snow continues piling on over the winter. I’ll start with the toughest portion first, but also the simplest. Advantages lie in this modest mode of ice travel, particularly in the fact that you’ll have to have less gear to haul around. Stuff a light sled with a simple auger, several rods, and a flasher, then carry some small tackle boxes on your person as you trudge to spots. Given your limited range, you’ll be forced to fish more strategically, and this especially applies to how you’ll be accessing spots. Flee from the busy accesses where trucks are streaming onto the lake, and focus on secondary access more associated with first ice. County parks, water that touches public road rights of way, and private access with permission is a great way of going after fish that haven’t seen a lure all winter, or at least since the beginning of winter. This is also a great time to focus on small bodies of water. You’ll know from the tracks left in snow whether or not it’s been getting pressure, and the smaller the lake, the less deep snow trudging there is by default. This is also a great time to focus on walk-in-access lakes, Scientific and Natural Area accesses, and catch-and-release only lakes like the one I fished a few weeks ago. We drug sleds a ¼ mile through a snowy access, and fished hard through the day, but were rewarded with some quality gills during the last 20 minutes of the day. I live for this kind of fishing. The ATV vs. snowmobile debate has raged in online forums and Facebook user groups for many years, and over the years, it’s mother nature that makes the final choice as to what will operate better on the open ice. Most years, an ATV’s effectiveness wanes through February, and especially into March, though ATV chains can extend you a few more weeks. Still, eventually, you’ll high-center and be hung up on the frame by thick snow that no longer allows passage. ATV’s once again have a great late-ice applications as snow melts and opens up lakes a bit in late March and April. While slower than snowmobiles, they’re smoother and typically have better storage solutions for holding your ice gear and keeping it out of the bottom of your sled. That said, during the heart of winter in a snowy season, it’s best to save your frustration and leave the ATVs at home. For long pokes and fast travel over deep snow, nothing beats a sled and flip-style fish-house combo. It’s how you need to fish in much of Canada and extreme northern portions of the US. There’s simply too much snow, for too long of the season, to expect good travel with anything else. Still, slush is just as much a killer for snowmobiles as it is any other means of travel. That’s why I’m a big fan of packing down your fishing area ahead of time with a snowmobile or group of them. Unhitch your shelter, and run back and forth between the access and all around your fishing area. Think of it as laying a track for all of the fishing you hope to do throughout the remainder of your stay. For long trips into the back country, this doesn’t make as much sense for the ride out, but it certainly does once you reach your fishing destination. 10 minutes spent packing down “landing” makes all the difference in the world when hole-hopping the rest of the day, and when you combine your runs with underwater contours from a GPS, you’re effectively marking out your spots before you fish them. That makes drilling, AND fishing a much easier task, so before you ever wet a line you’re increasing the likelihood that you’ll fish longer and better. Vehicles are the most limiting means of travel on ice during these conditions when you think about it, but they’re a necessity if towing a wheelhouse. Unfortunately, they’re also the most dangerous, so good planning on previously scouted roads is a must. This past weekend we avoided a better portion of one lake, and two accesses at another, simply because of unsafe and unproven travel. Be especially mindful of lake neck-down areas. So often there’s flow and thin ice in these areas, even during the coldest dead of winter. Even a path over shallow water can be an expensive date, so consider driving on plowed roads only. Of course, a buddy with a plow is a huge asset in this instance. So is a resort with a plow-driver that will work for cash. A premium during this time of year is uncharted waters that haven’t seen any pressure, so it’s worth some dough for a custom plow-in. Remember however, that your safety is your responsibility alone when it comes to getting out and off of the lake. Too many people consider this plow payment an insurance policy should poor weather, additional snow, or further drifting strand you. My advice? Leave before it gets bad, have a “Plan B,” and check with the driver about fees to get off or out should you decide to stay if conditions suddenly change. Good tires go a long way on a lake, but realize the limitations of your vehicle when deep snow hangs up on the suspension and frame. Going off-road sounds great from a fishing perspective, but big drifts, slush pockets, and hidden ice chunks can get the best of all who Baja. Whichever method you choose, be safe out there, focus on fish that haven’t been harassed, and get creative with your bites and access to get after the best of late winter fishing. Using an Otter as a Scouthouse could be the very best way to find fish to park on. It always amazes me how a sea of anglers can be so willing to sit over a featureless, and often fishless, chunk of underwater real-estate. Such is commonplace among wheelhouse anglers who are as interested in the ice experience as much as they are the actual fishing. Far be it from me to tell them where or how to fish, but with a little bit of preparation and planning, you can have your fish and cook them too. Here’s a few ways to maximize your time in the wheelhouse and stay on fish. The best scenario involves setting up a basecamp in a likely area, but one you are not married to. That is right, setup with the intention of eventually moving. Especially in the toy-hauler editions, wheelhouses these days go hand-in-hand with portable shelters, ATVs, and snowmobiles. Use these tools to go out and find actively biting fish, with the hopes that you will eventually move basecamp to the active biters. The Scouthouse concept is something I detailed a few issues back, and has been successful in the past for me. It’s also something that’s fun with a group of like-minded anglers, all willing to search out a great bite such that eventually you can drop the big-house right on top of a good pod of fish. Dropping on fish usually comes with some good scouting and prep-work. Of course rarely is it as easy as picking a spot on a map, even with some great scouting, where fish are going to be active. That is where some homework comes into play. Navionics has a free, web-based mapping utility, and there are other good paid options out there too. Any good trip planning should focus efforts on identifying likely fish-holding areas, but big wheelhouses often can’t just roam the open ice. That is where a discussion with your resort of choice on big lakes or some truck scouting on-lake personally can yield big dividends. At the end of the day, with enough snow, you will need plowed roads to make it to your destination, and the resort may need to plow a spot specifically for your house. Working with them will ensure the best result, and don’t be afraid to offer a few extra bucks for a custom plowing job. The best waypoints on the lake will not yield results if you can’t get to them, so first identify what’s open if at all possible. For walleyes, so often the deep structure mid-winter (wheelhouse season) has day-long appeal, especially in stained water, whereas classic hard-bottomed structure may be too shallow to attract any fish except early morning or late evening. All of which may be just fine if you’re only going to be fishing in the wheelhouse during primetime, but keep that in mind. Deep water structure can mean humps, bars, and gravel, but it can also be mud or small depressions just off of that same structure. These secondary spots are often overlooked by the crowds and can yield great success. For panfish, you are often looking to basins for open water crappies, and the edges of them for gills in many northern lakes. Do not forget about shallow fish however, and keep in mind that when crowds form in the community holes, there’s usually a shallow weed-bite that you can have to yourself. Again, this is something that will take some previous scouting or expertise, as the best cabbage and coontail beds in the lake are not always easily identifiable. These shallow fish can be trip savers when deep snow or large crowds overrun other spots on the lake. As winter snow persists, and on-ice travel becomes more challenging, you see on-ice communities get a bit too cozy for my liking. You would probably not be surprised then to learn that I like to avoid the crowds whenever possible. Even in deep water, the crescendo of noise from increasing numbers of generators, augers, and vehicles can turn off fish in general. Crappies suspended over deeper water seem to have some tolerance for it, but my experience is that there is often other areas and better fishing to be had on the same lake. If I do join the crowd, I try to be strategic in my placement, thinking both above water and below it. From an underwater perspective, basin fish will often hang up on inside turns and use that to funnel from deep to shallow, so consider setting up on the edge of a community hole where such an escape route from the noise exists. If there are some small deep-water irregularities to the contours, or bumps off the main structure that most people are on, I will park it to the edge and have those to myself. Think about where the traffic is coming above ice as well, as I like to setup as far to the edge of the main roads and heavy traffic as possible. Heavy cracking and popping from vehicle noise spooks fish, plain and simple. Simple observation for a few minutes of your ice-fishing brethren will quickly tell you who’s going to be noisy and who’s there to fish. Do your best to stake out a spot that is kind to others on the ice, but also ensures you won’t be crowded later by newcomers to the spot. A strategically placed shovel, bucket, and especially a tip-up will help fellow anglers keep a reasonable distance and prevent close-parkers. Hopefully snow will subside and we’ll get great ice and easy travel, but even if that’s not the case, some preparation and strategic placement can make all the difference for your next outing. While permanent fish houses have long been a fixture on Minnesota’s frozen waters, the rise in wheelhouse ownership across the state and beyond is readily apparent each time you drive by your favorite lake. Long-time ice anglers and casual summer anglers alike are drawn to the ice by convenience, effectiveness, and the fun “camping” aspect that is wheelhouse fishing. I thought it would be a good idea for new anglers and old to review some regulations, but also get the straight scoop from a warden on how to best observe fish and game laws as they pertain to wheelhouse and permanent shelter fishing. Kylan Hill, Conservation Officer (CO) from the Zumbrota, MN station helped answer a few of my own questions, and gave insight on what to expect when being checked on the ice. All of the above requirements are visible from the outside of the shelter, whether occupied or not, but what to expect when visited by a Conservation Officer while you are fishing? Kylan offers, “we always first just knock on the door and announce ourselves.” From there CO’s make sure everyone fishing has a valid license on their person. “It’s probably one of the most common violations,” Hill says, “but with all of the digital means from your phone along with hard-copy options, there’s no excuse not to have a proof of license purchase with you.” That can mean a screenshot image of your fishing license, a PDF of an online copy, or some of the more traditional methods as well, but either way, you will need it if you are fishing. Your average check starts with licenses, but moves to fish, especially if fishing has been good. Kylan states “CO’s are allowed to inspect coolers, conveyance, or containers that could hold a wild animal,” which in a fishhouse could mean about anything, including the kitchen sink. “We’ve found fish in snowbanks, cupboards and cabinets, even toilets,” Kylan says, “and we keep an eye out for such violations, especially if there’s suspicious activity, obvious signs of fish cleaning, blood, or other observations that would lead us to believe fish are being kept.” Remember that by engaging in a regulated activity like fishing, you are obligated to show your license and cooperate by showing your catch. “Failure to do so results in a citation, and most anglers cooperate,” says Hill. Hill also says, “You can’t possess dressed fillets in a fish house on special regulations lakes, even if a skin tag is attached; unless they’re prepared by a licensed fish packer, or you have legal length, fully intact carcasses to measure.” Kylan states a key point, “Remember that if you’ve caught, cooked, and eaten a limit of a certain species, you’re done fishing for that day.” He continues, “If an angler does choose to clean fish on the lake, they must be in the process of cooking them at the same time, as-in, hot oil in the pan.” Bottom line, if you are going to cook and eat fish that you catch on the ice, you must fillet and immediately eat while saving all carcasses from your take. Of course, any illegal activity regarding drugs or alcohol is subject to enforcement action, yet among some of the many illegalities officers observe in the field. Hill says, “anglers sometimes get a bit too comfortable in their ice houses, and bring illegal substances and activities from home.” It is good to remember that you’re on a public waterway for that reason, whether in the house, or outside on a snowmobile, ATV, or other ice vehicle. Kylan mentions, “a good number of our checks involve making sure that vehicle licensing, registration, and safety equipment like helmets are in order. Overall, safety is a great concern of ours out on the ice, so a safety checklist goes a long way. For out on the open ice, picks, cleats, and a float suit or PFD are great items to have. Inside of the house, a fire extinguisher and carbon monoxide detector is key, especially for home-made houses,” says Hill. Avoiding suspicion is usually easy provided you’re not involved in suspicious activity I’ve found, and it’s always good to remember that observing fish and game laws is about more than just staying legal, it’s to promote the safety of our anglers and the future of our resource. Some of the best meals you’ll ever have are eaten outdoors. In the thick of it, while back-country camping or cooking shore lunch on a rocky Canadian Shield lake. Everything tastes better when you’ve hand-crafted it, worked for it. Winter’s version of that in the North Country is a meal made on the ice, and with the advances in wheelhouses these days, our options are getting a whole lot better than just burnt wienies on an inverted sunflower heater. These days, more and more anglers have access to electric power on ice, a key cooking aid which removes some of the primal appeal, but makes up for it in opportunities to eat well. Microwaves, refrigerators, and a myriad of appliances like crockpots, toaster ovens, and even blenders can make any ice house like your very own home kitchen. Many wheelhouses already come with an oven, and frozen pizzas from them can certainly hit the spot. Even when the crust is borderline burnt and the top is barely thawed, something warm to eat is always welcome. That said, with a small bit of planning, we can do a whole lot better, for less money and effort than you’d expect. First things first, you need to have some tools at your disposal, and on-hand staples are a necessity here just like at home. Start with some basic cookware; hand-me-down skillets, a camping pot/lid, along with some measuring cups (dry and liquid) and silverware are a good start. Ziploc bags, some paper plates, cups, and mugs are going to be needed too. You’ll need knives to clean fish, cutting boards to fillet them on, and even some oddballs like can openers, kitchen towels, and hot pads. The venerable crockpot is a great addition, but you can use the one from home in this application. Then focus on some ingredients, mostly in the form of seasonings and spices, with most of the rest of the parts to any meal being something you’ll plan for on an individual basis. Put your fish-cooking gear together in a kit, as pots, stands, and the rest of the equipment is something you’ll likely be hauling into and out-of the fish house, rather than keeping as resident items. I’ve cooked fish both inside and outside, and truly prefer doing the job on the open ice. Some people complain of the smell of oil and fish, but the biggest issue I have is hot oil in an active environment. Rattle reels go off, kids run to the bathroom, and the general chaos of a busy fish-house can make the scalding oil a scary proposition. You’ll also make whatever mess there is from breading and crackling oil outside rather than in. None of which sounds like great fun in high winds and cold temperatures on a pitch-black evening, but I’ve found it to be a small price to pay for a better and safer situation. The key to frying quality fish is hot oil, so I prefer a cast-iron dutch oven to fry out of because it retains heat well, and make sure to use a thermometer for the oil and crank the propane just before you drop the fish in. For anyone who’s used a camper oven, you know that the heat comes from the bottom, in force. Many a burnt pizza has been served from these types of ovens, and really the only solution I’ve found is severalfold. First, find a rectangular pizza stone or similar buffer to put directly on the bottom rack. Next, cook any items destined for the rack on a wire rack over a pan. While this seems like a hassle, it’ll keep everything you put in one of these from burning on the bottom. You’ll still get the crispiness and flavor, without the scorched flavor and overdone-ness. I’ve had some really great meals in fish-houses over the years, and among them have certainly been a good number of soups and stews. Many of these can be made ahead and refrigerated or frozen, then simply dumped into a crockpot for warming. A good many more have been homemade concoctions in the oven, steaks on an open grill outside, and especially morning diner-style breakfasts. Coolers can be a great asset, especially inside your vehicle as they’ll keep items cold quite often without allowing them to fully freeze, so use that in your repertoire as needed. The best meal I’ve had on ice? Well it would have to be the Kaiser’s ribs. As in Kaiser Wilhelm II, German Emperor and King of Prussia. Billy Lindner, famed photographer and Fishing Hall of Fame Member is a descendant of the personal chef to the Kaiser, and last winter he made his ancestor’s recipe for us on a filming and photo shoot. Pork ribs, stewed in a rich and fragrant mixture of beer, broth, sauerkraut, and root vegetables were more than we could ever hope for after a long day’s work. Well, that’s about all I can remember (or disclose) about the Kaiser’s ribs, but I can tell you it beat any frozen pizza I’ll ever have by miles. It also serves as proof that with a little bit of preparation and planning, you can eat as well or better in the fish-house than you do at home. Ice fishing is likely the fastest growing segment in all of sport fishing. That’s in no small part due to the development in creature comforts that have fundamentally changed the mechanics of the sport. A five-gallon bucket has turned into any number of portable or permanent structures with a built-in seat. The massive, exhaust-spewing power augers of old are now odor-free, lightweight electric powerhouses that drill many dozens of holes on a single charge. Bib overalls and flannel have given way to ice-specific suits that are ergonomically designed for the rigors of the sport. Maybe all you’ve added to the arsenal in the past few years is a couple jigs, or maybe you’re coming back into the sport after a hiatus of a few years. Even if you keep your ear to the ice every season, it's often wise to let first-year products enjoy a few cycles before investing in a dead end. That said, each of the categories below are tried, tested, and true technologies that I see only advancing rather then retreating. 1. Electric Auger – Today’s electric augers are major contenders in the space. Unless you’re drilling in extremely thick ice, or hundreds of holes per session, you may likely already own one. No mixed gas or smoke-filled permanents are another major advantage of the tech. Add to that, that trend towards lighter-weight options, and you’re no longer looking at 40 pound steel grinders that you have to prime, pull, and maintain a carburetor on. Click “on,” and flick a switch to drill. I’ve been using this electric auger for the past few years with great results. 2. Custom Ice Rods – Go ahead, live a little. More importantly, take the species and situation you face most often, and select an appropriate tool for the job. These days, custom ice rods are expressly made to solve problems on the ice, and give you, the angler, the upper hand. Whether you fish shallow water for gills, or deep rock lakers, there’s a custom rod for you that will be lighter, more sensitive, and plain catch more fish than any of your other sticks combined. While they can be expensive, they’re a mere fraction of their open-water counterparts, and worth the money in my opinion. I helped design and develop the Croix Custom Ice Lineup by St. Croix Rods. Check them out here, or read up to find the perfect CCI for you! 3. Floating Ice Fishing Suit – Whether you tempt the fates with early and late ice excursions or not, talk to 10 ice anglers and each of them will have a different story about ice that should’ve been safe and wasn’t. For your troubles, you’ll get a bib and jacket combination that holds tackle boxes and bait pucks exactly where you’ll need them, and will have padding in the places an ice angler requires. Not to mention, with venting technologies and the quality of garments out there, you’ll be comfortable no matter the temperature. I wear the Striker Predator bibs and jacket for safety as much as comfort. 4. Digital/Lithium Sonar Technology – I’m a big fan of the analog units out there, as they’ve stood the test of time and caught gobs of fish doing it. Still, the advantages of digital sonar can’t be ignored. Customizable views allow you to set up a screen however you like, while maximizing the real-estate offered for only the fish-catching information that’s interesting to you. While you’re at it, you should power your electronics with a lithium battery. 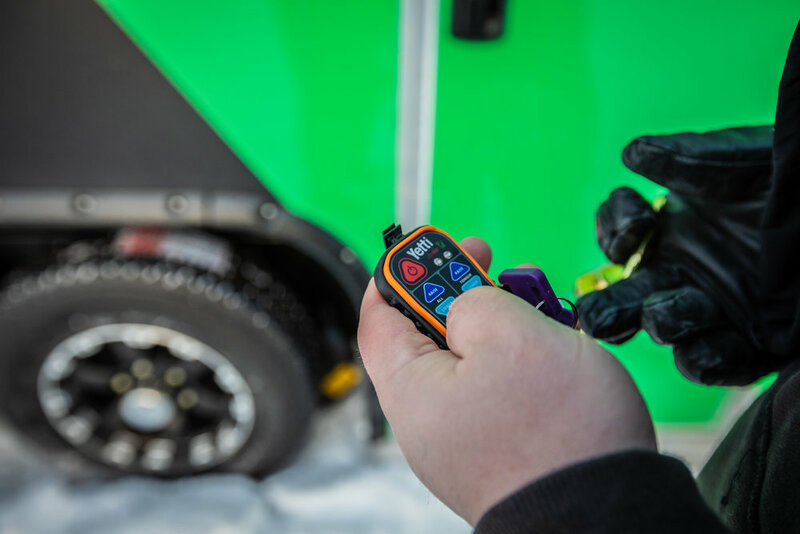 All the rage in everything from electric cars to power drills, your electric ice-auger has one because of the incredible long life, weight savings, and cold-weather performance. Lead acid batteries for fish-finders will likely soon become a thing of the past, as manufacturers are now starting to sell their electronics with lithium power onboard. I run both the Lithium LX-7 for a combination of hole-hopping and stationary fishing, and hole hop almost exclusively with my Lithium M5. 5. Shelter – No matter what your budget, there’s a great shelter upgrade out there waiting for you. From fully thermal hub-style portables, all the way to fully decked out wheelhouses, there’s never been more choices on the marketplace than we have right now. On the upper end, with increased materials costs, borrowing rates, and tariffs, wheelhouses and the like will probably only continue to go up in price so this could be a good year if you were already budgeting for one. On the other end of the spectrum, you’ve got incredible performance fabrics and thermal insulation that makes hub and flip-style shelters remarkably durable and easy to heat. I run an Otter XT Lodge and have been really liking the side-entry feature on the X-Over editions. For the hub angler, the XT Lodge Hub has been perfect for my family. While a part of me loves the nostalgia of frozen days gone by, ice fishing is more enjoyable when you’re warm and comfortable. Catching fish while doing so has no doubt led countless new people to the sport.